On Saturday night the number one PPV attraction in combat sports will defend his world title. I’m not talking about Floyd Mayweather Jr., the past PPV king who has yet to officially announce the details of his next proposed fight. I’m talking about Conor McGregor, the UFC’s cash cow who’s set to take on undefeated challenger Khabib Nurmagomedov. As recently as last year, if a UFC fight card was on PPV and an outlet like HBO or Showtime put on a competing card, you could expect HBO or Showtime to still get decent ratings. However, the times have changed and HBO is making an exit from broadcasting boxing and will be completely out of boxing by the time 2019 arrives. The future for boxing fans is streaming, and the future is here. One of the bigger complaints against HBO Boxing was that you couldn’t watch a fight on their network live via streaming. You could subscribe to a service like HBO GO without a cable television provider or satellite provider, but you could not watch fights live, only on tape delay. Showtime has that option for their subscribers, which reflects the inclinations of the younger generation to cut the chord and stream their programming and also reflected Showtime’s commitment to the sport of boxing. Showtime would still probably get good numbers if they were to counter program against the UFC, but they even have a streaming option for fights available for their customers. HBO has a wide array of programming for their subscribers and charges approximately $15 per month. Some of their consumers got HBO solely for boxing, and would shell out additional money per month for their PPV offerings. The number of fights that HBO put on yearly has been on the decline, as well as their budget. For the same $15 a month, fight fans can get high quality fights on both ESPN+ and DAZN and a much larger number of boxing matches. DAZN has contracts to televised both boxing and MMA. 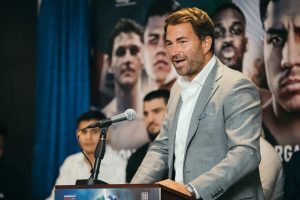 They plan to televised 16 boxing events in the United States and 16 boxing events in the United Kingdom with Matchroom Boxing per year. They plan to show 15 World Boxing Super Series events per year with 21 tournament bouts. They have a contract with Combate Americas for thirteen events a year. They also have a contract to broadcast some of Bellator MMA’s biggest events, who have named fighters such as Chael Sonnen, Rampage Jackson, Rory McDonald, Gegard Mousasi, and Fedor Emelianenko under contract. ESPN+ also has plans to put on a large number of MMA and boxing events on their platform. When ESPN originally announced their contract with Top Rank they indicated they will show at least 12 live fight cards from the US and six international cards. They’ve already signed an extension on that deal that will call for 18 cards to air on ESPN, 12 prime-time cards that will stream exclusively on ESPN+, and 24 premium international events to be shown on ESPN+. While DAZN has Bellator and Combate Americas; ESPN+ has a contract with the UFC, the MMA powerhouse. The deal that ESPN+ has with the UFC is for 10 UFC Fight Night cards on ESPN and 20 UFC Fight Night cards on ESPN+ per year. In the past boxing fans who were not fans of the UFC would usually turn to their premium networks to watch boxing during a UFC PPV. This weekend, boxing fans have plenty of other options. On ESPN+ they can watch a bantamweight bout between Luis Nery and Jason Canoy from Tijuana, Mexico and also watch a junior welterweight fight between Jack Catterall and Ohara Davies from Leicester, England in the junior welterweight division. On DAZN they can watch a welterweight bout between Jessie Vargas and Thomas Dulorme, as well as an IBF Light Heavyweight bout between Artur Beterbiev and Callum Johnson, as well as a WBA Junior Featherweight bout between Danny Roman and Gavin McDonnell. Additionally, fight fans can also watch on DAZN a WBA Bantamweight Title bout between Naoya Inoue and Juan Carlos Payano as well as a WBA Junior Welterweight bout between Kiryl Relikh and Eduard Troyanovsky. These bouts are part of the World Boxing Super Series and will be broadcast from Yokohama, Japan. So while all the hype and marketing this week is behind Conor McGregor and Khabib Nurmagomedov, boxing fans still have a chance to see a high quality card from Chicago and Japan on DAZN, and a boxing card from England and Mexico on ESPN+. If you’re already a subscriber you know of the quality and quantity of boxing fights these services offer. Finally, the streaming services offer viewers an opportunity to watch an entire card, from opening fight to the main fight, and not just the top two or three fights. This will allow fans to get a better look at prospects early on in their career. For boxing fans, the price of ESPN+ and DAZN combined is about the same price as a monthly subscription to HBO. But the quality and quantity of content is far greater with these streaming services. If you’re not a fan of the UFC and are looking for other viewing options, might as well sign up with these streaming services for a month and enjoy. And get used to it, for streaming is the new normal for boxing fans. At close inspection, it appears to be a better normal.